Here’s another historically significant plane from the Midway Group build. 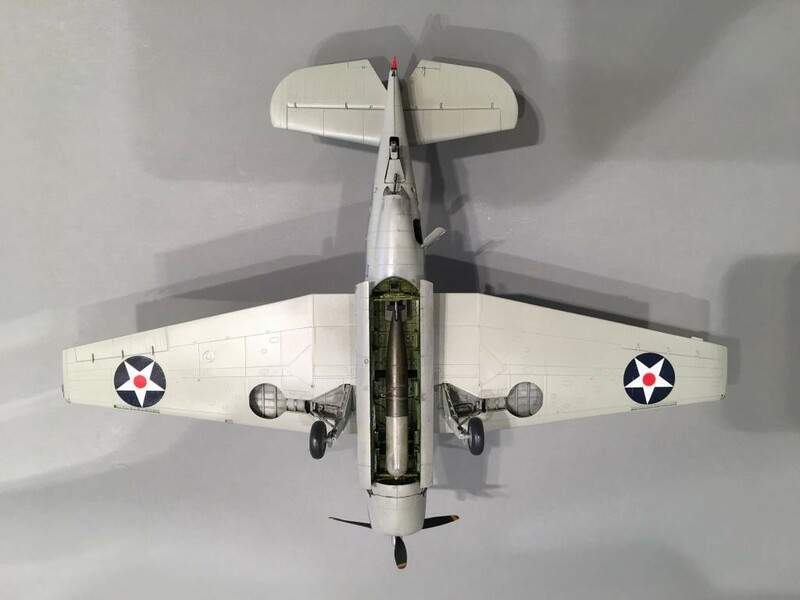 This plane represents the sole surviving Grumman TBF Avenger from Torpedo 8. 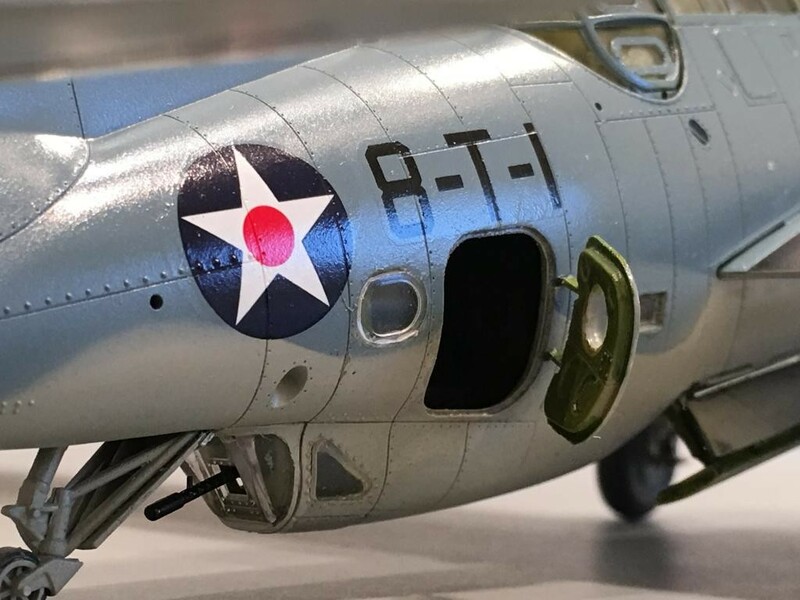 This plane managed to limp back home after being mauled by Japanese Zero fighters on June 4th, 1942, exactly 75 years ago today… The turret gunner Jay Manning was dead, the radio operator Harry Ferrier and pilot Ensign Bert Earnest were both wounded. 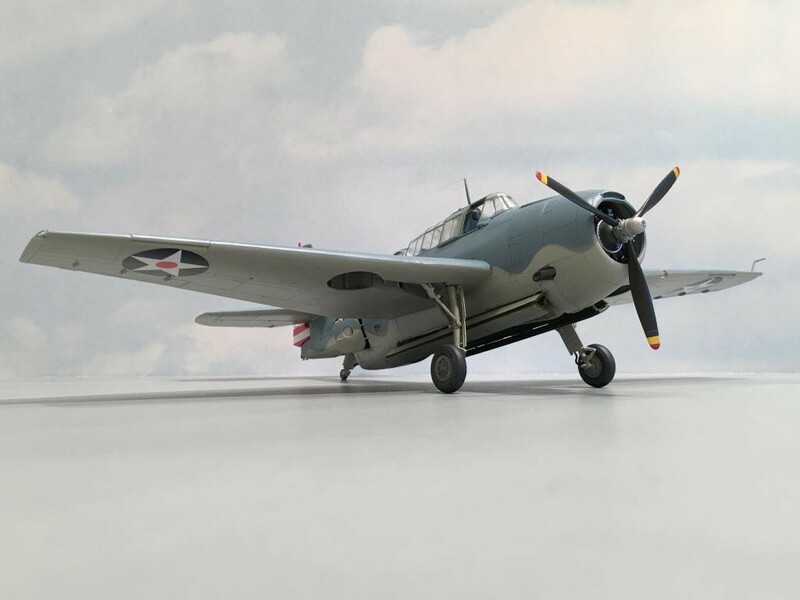 Not only is it the sole surviving Avenger, but this was the very first combat debut for the new plane as it was just entering “Combat” service with the US Navy. 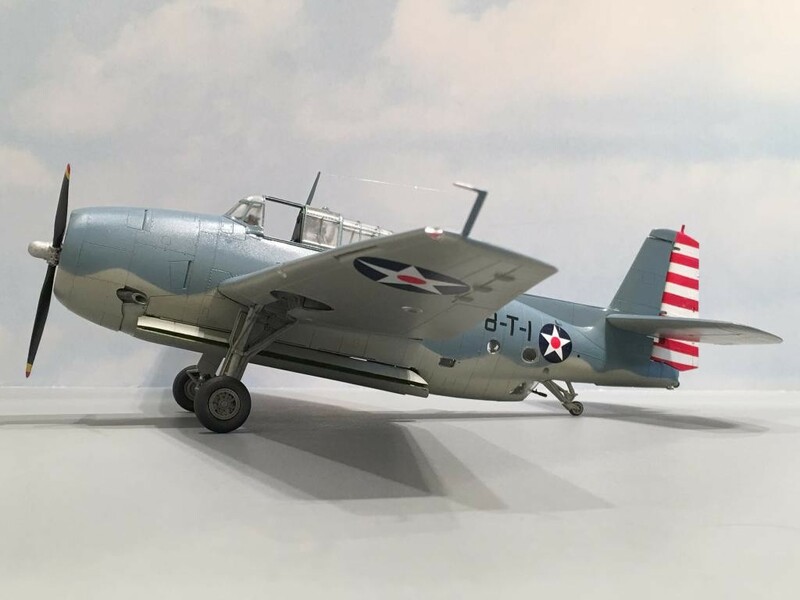 It is also the sole surviving torpedo plane from Torpedo 8, as the remaining Douglas TBD Devastators from this unit operating from the USS Hornet had all been shot down. VT-8 took charge of these brand spanking new Grumman Avengers in March of 1942. The planes were at Norfolk Virginia, when this rare color publicity photograph was taken showing the acceptance by the US Navy. This is the photograph that inspired my build. These black and white photographs were taken later in March after the unit markings had been painted on. You can see that the tips of the propellers were painted red / yellow / blue as delivered by Grumman. 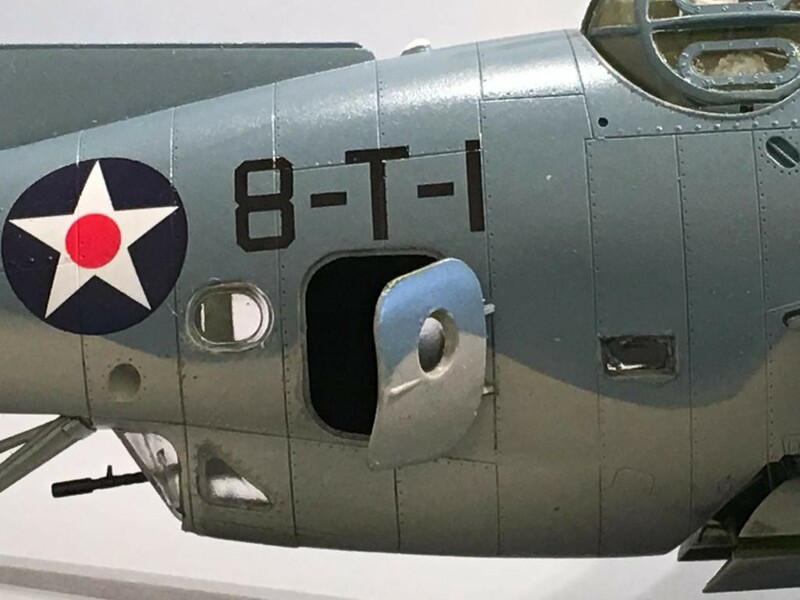 If you look closely at this picture below, you can see “8-T-1” painted on the side of the fuselage. It also has a much smaller US National insignia than what was carried on the plane later on. 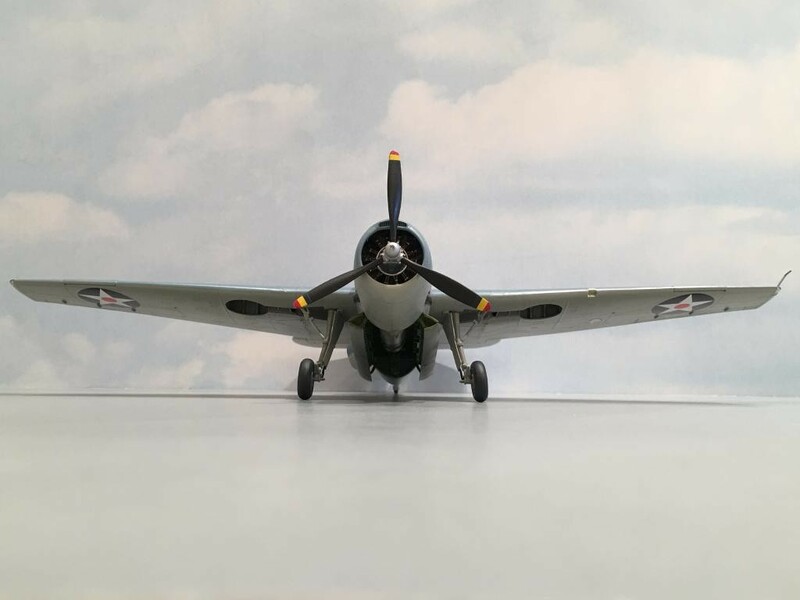 A small detachment from Torpedo 8 (consisting of 6 of the new Grumman TBF-1 Avenger planes) were sent to Midway Island separately, since they had been training on the new Grumman plane in Norfolk. 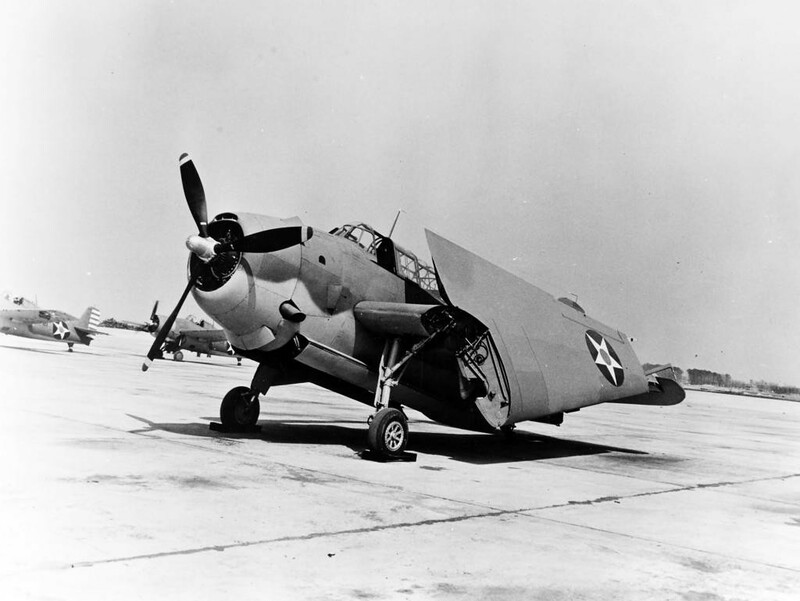 The rest of the VT-8 group, which were still flying the older Douglas built TBD Devastators, were still on board the USS Hornet. 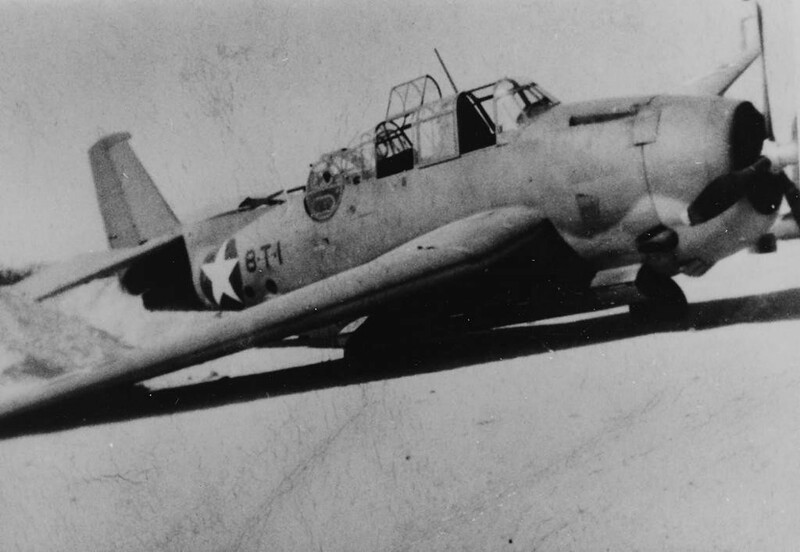 This detachment from VT-8, flying the new Avengers, made their torpedo runs and failed to inflict any damage. It is not known if they simply missed the intended targets, or if the torpedoes failed to detonate upon impact. The torpedoes used by the US Navy at this time were notoriously unreliable, so I doubt it will ever be known for sure. 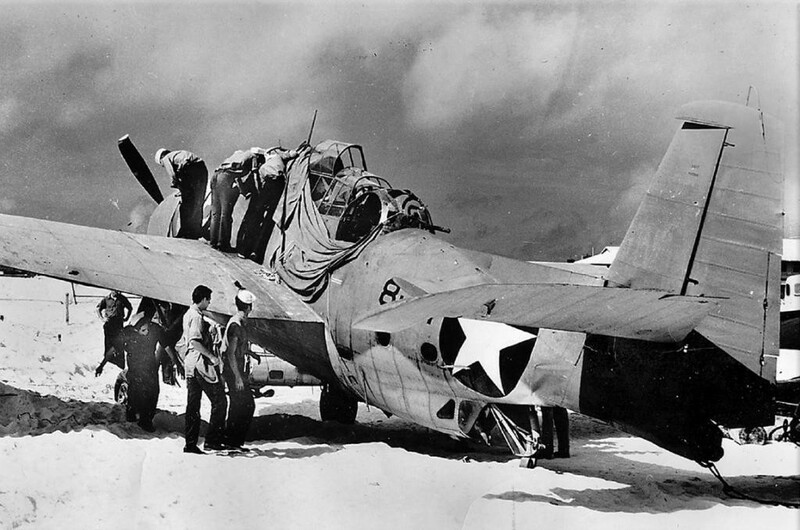 Out of the six TBF Avengers sent into combat for the very first time from Midway Island, this one, “8-T-1”, is the only one that returned. The rest were shot down and there were no surviving crew members from any of the other planes. 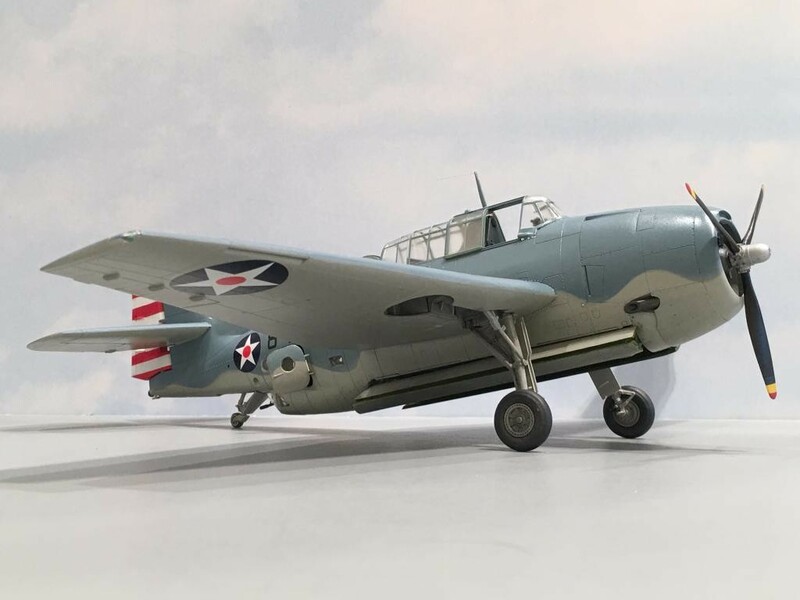 The elevator control cables had been shot away, and pilot Ensign Evans had to use the elevator trim tabs to try and coax the plane to climb after releasing the torpedo. 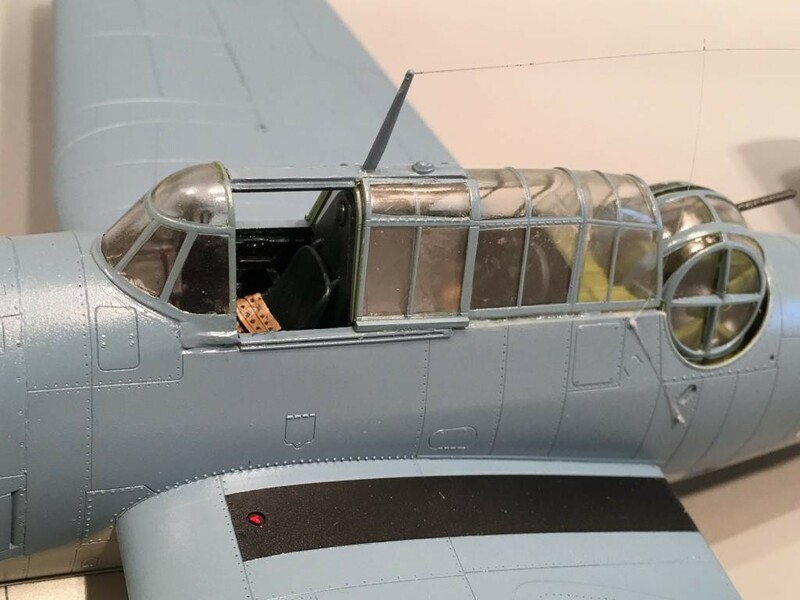 There was considerable damage done by enemy gunfire throughout the Avenger’s airframe. I have read where the tail wheel assembly dropped down from the raised position due to damage inflicted by the Zero’s. 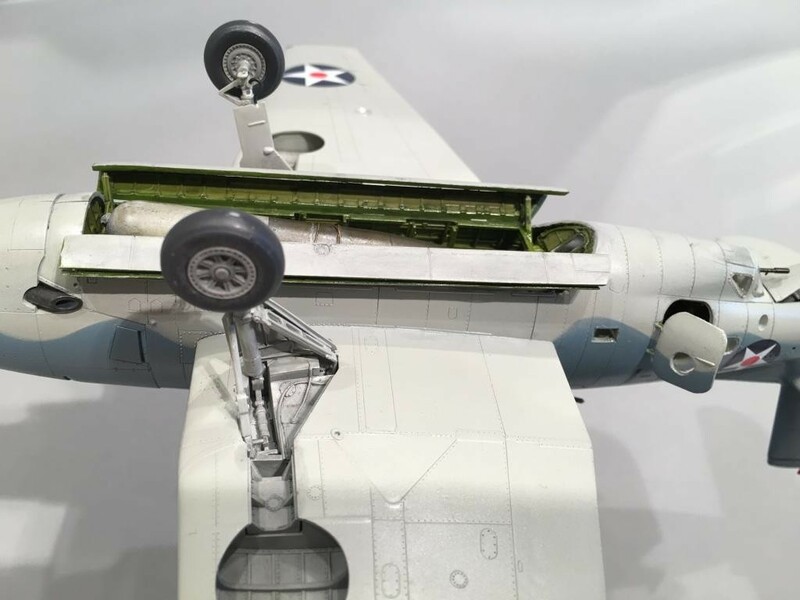 When the tail wheel assembly dropped, it blocked the “stinger” .030 caliber machine gun located in the belly of the Avenger. 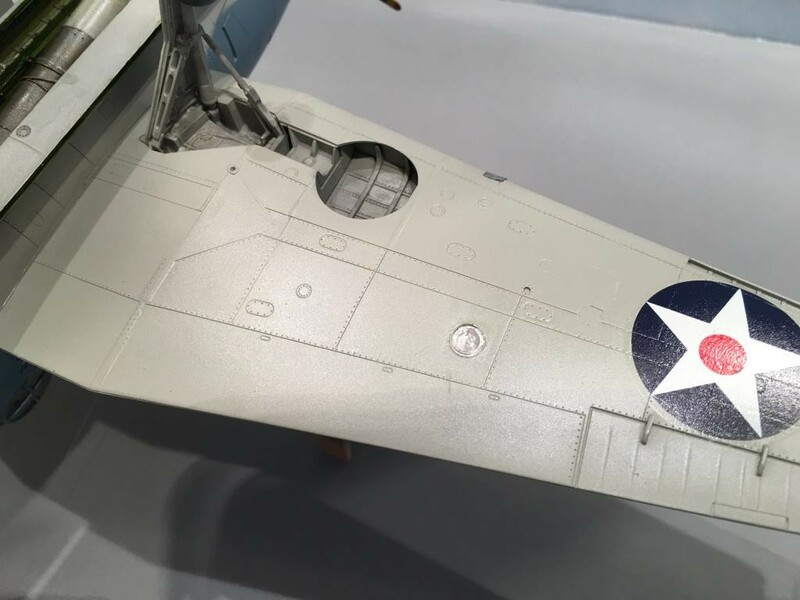 With the turret gunner dead, no way to fire the stinger gun because the tail wheel blocked its field of fire, the plane was defenseless against the Zero attacks. The only weapon available for use was the cowling mounted machine gun operated by the pilot. Considering that Evans was busy trying to get the plane to respond to the trim tab inputs, he was not in any position to take a shot at any Zero that was foolish enough to get in front of him. Ensign Evans crash landed the plane on the beach at Midway Island since it was all he could do to keep the plane airborne. 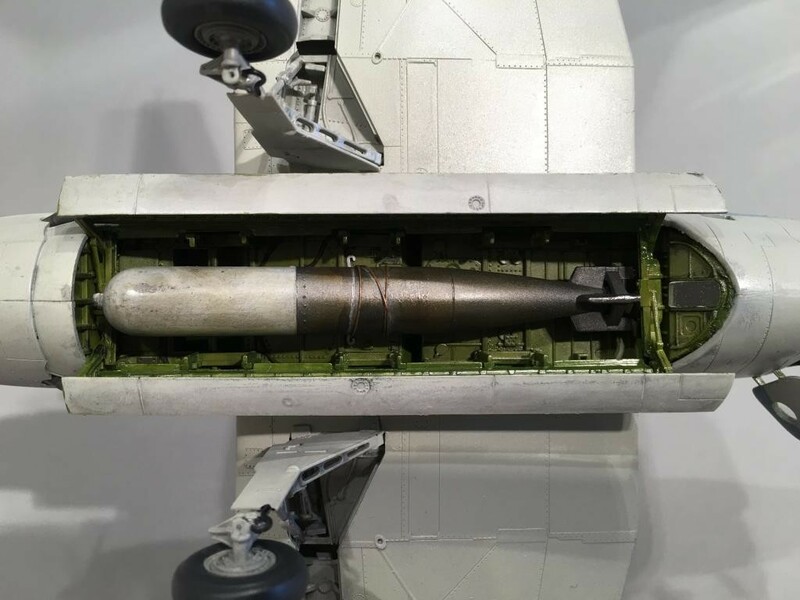 It was so badly shot up that it had to be scrapped and never took to the skies again. The fact that this plane was able to make it back to Midway in it’s condition, especially with all of the crew either being injured or dead, is simply amazing. 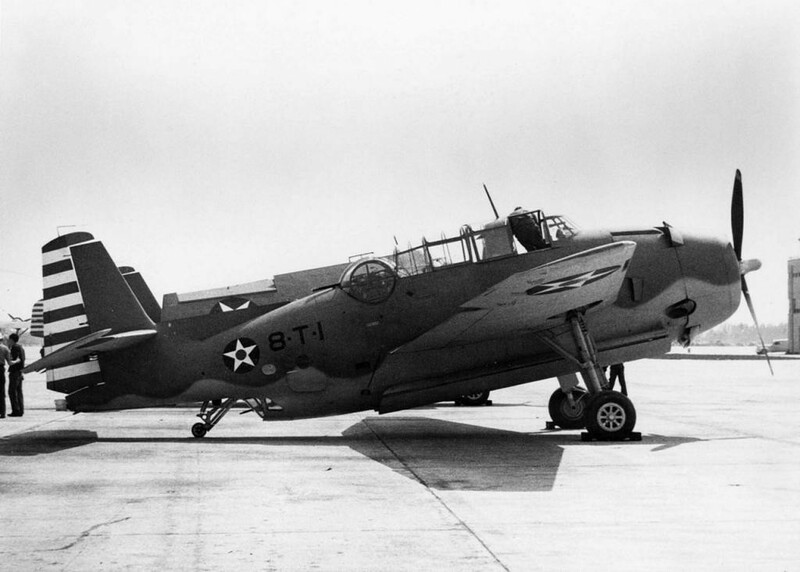 It was a hint of things to come demonstrating the ruggedness of these Grumman built planes. Here are a few pictures I found online of the plane after it landed. 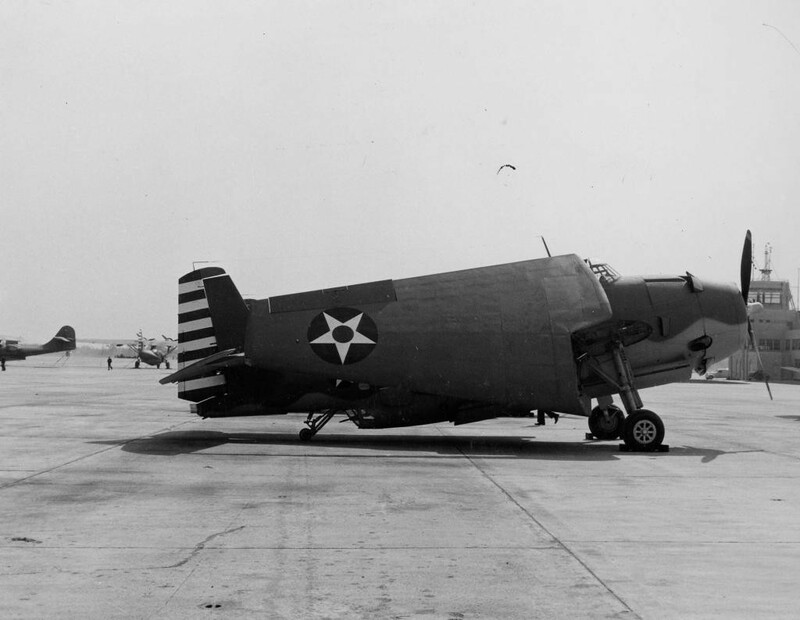 This picture shows the plane after the salvage crew managed to get it back on the landing gear… The Starboard side main wheel failed to lock down or simply would not lower due to gunfire damage. and I was able to find a close up picture showing some of the damage done to the turret, where Jay Manning was killed. 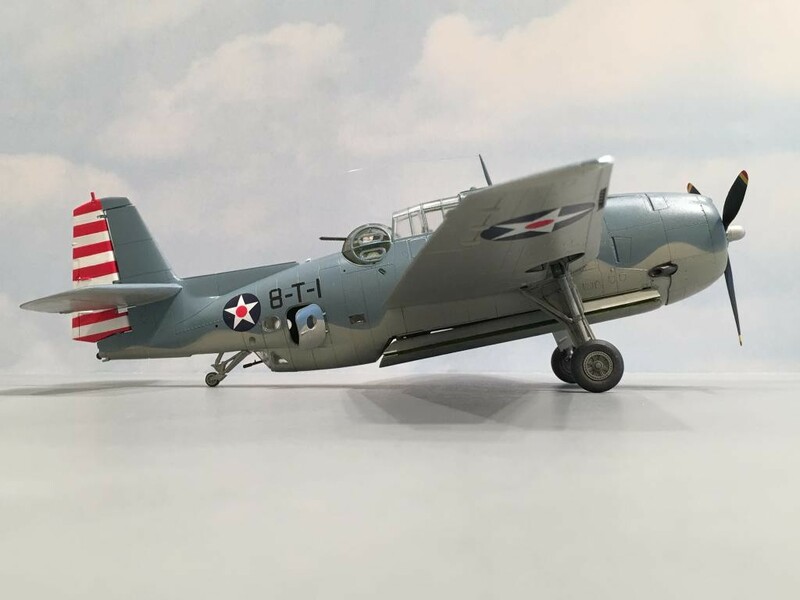 I started out with the 1/48 Accurate Miniatures TBF-1C kit. 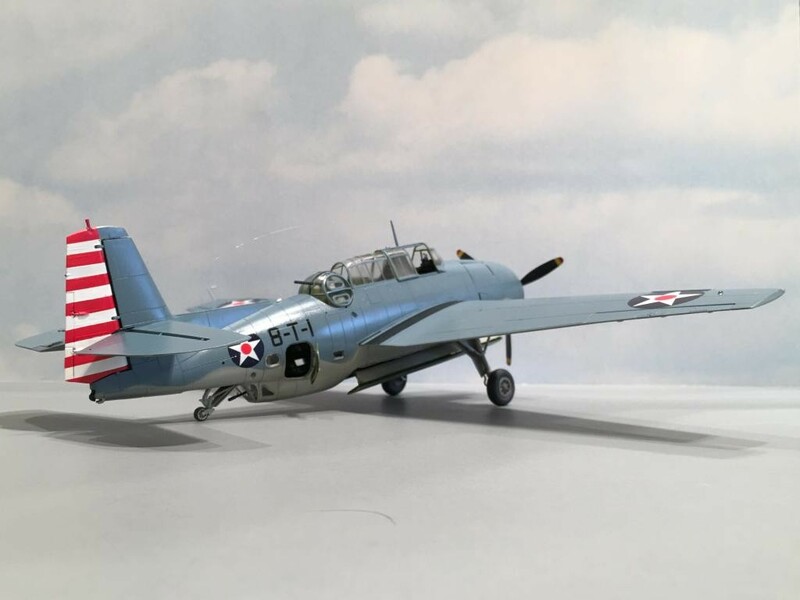 In order to build this early version of the TBF-1 Avenger, I had to make some modifications to the kit. My friend Martin Dytrych sent me some great information about the differences found on the early Avengers. Thanks again Martin ! 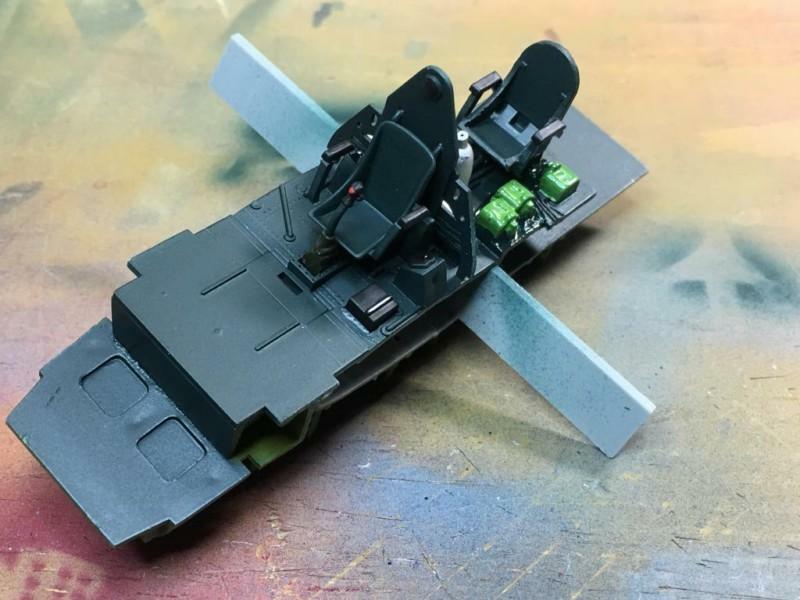 and filling in the shell / link ejection ports located on the underside of the wings, also for the wing mounted weapons. 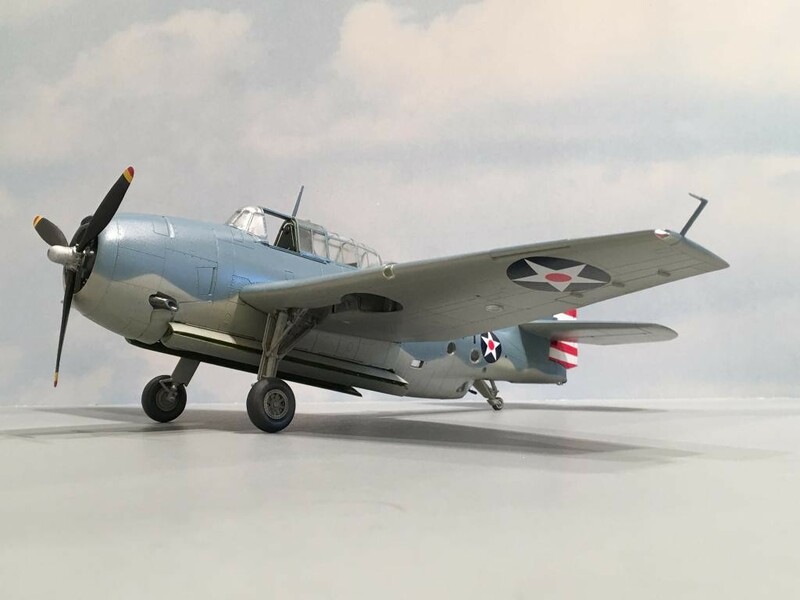 I wanted to build my plane as it looked shortly after it’s acceptance by the US Navy, after it had been assigned to Torpedo 8 at Norfolk Virginia. I like the colors used during this era. 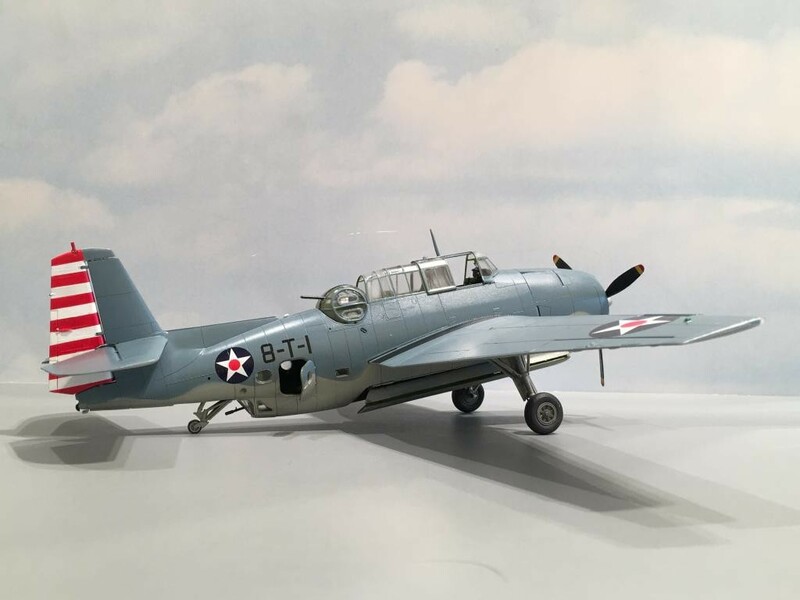 This was my very first Accurate Miniatures Avenger build. I am sure it will not be the last. 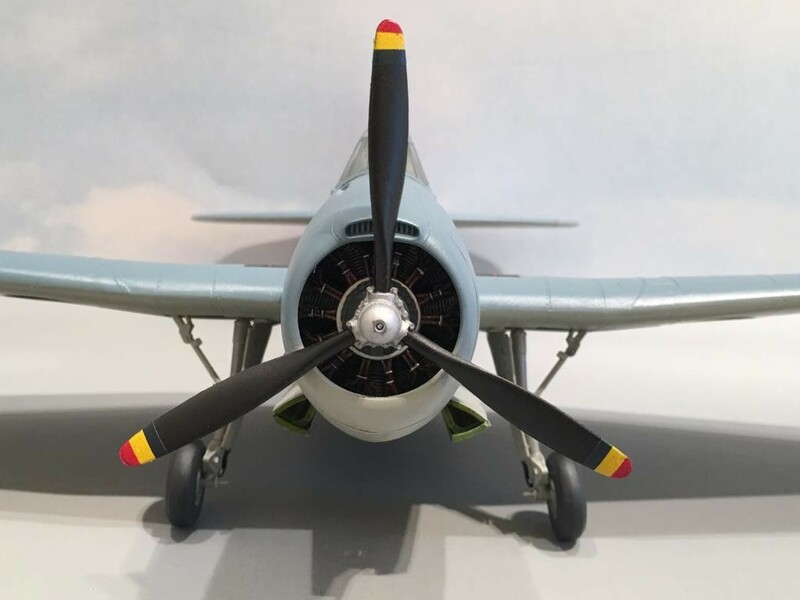 I hope you have enjoyed reading about this very important plane as much as I have enjoyed building and researching it. As usual, comments are encouraged. Thanks Gary. I appreciate the compliment Sir !!! 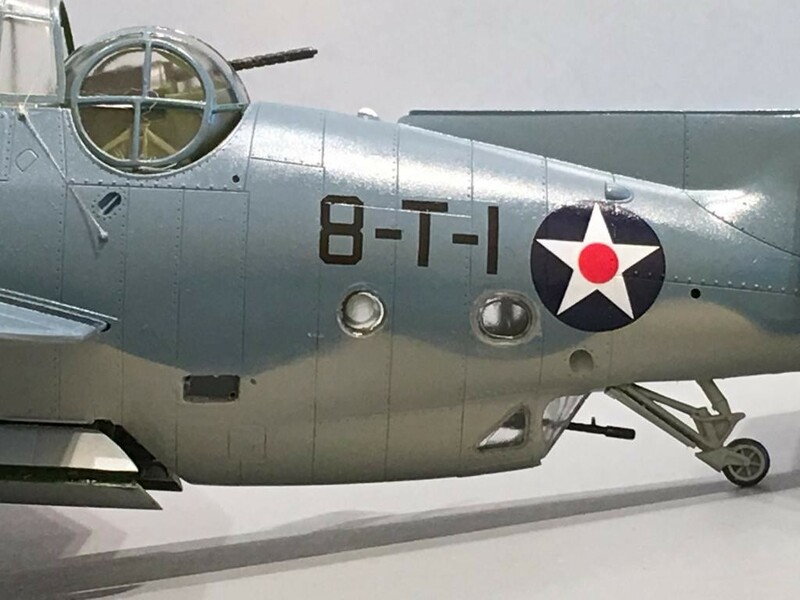 Terrific work backdating the Accurate Miniatures Avenger! 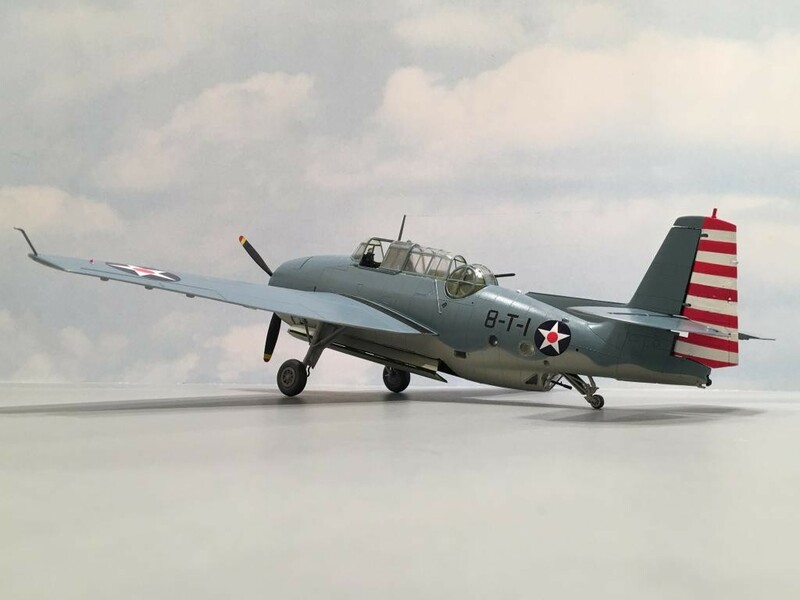 t’s a terrific kit, and you certainly did it justice. Thank you Drew. It was a lot of work back dating this one, but I think it was worth it in the end. 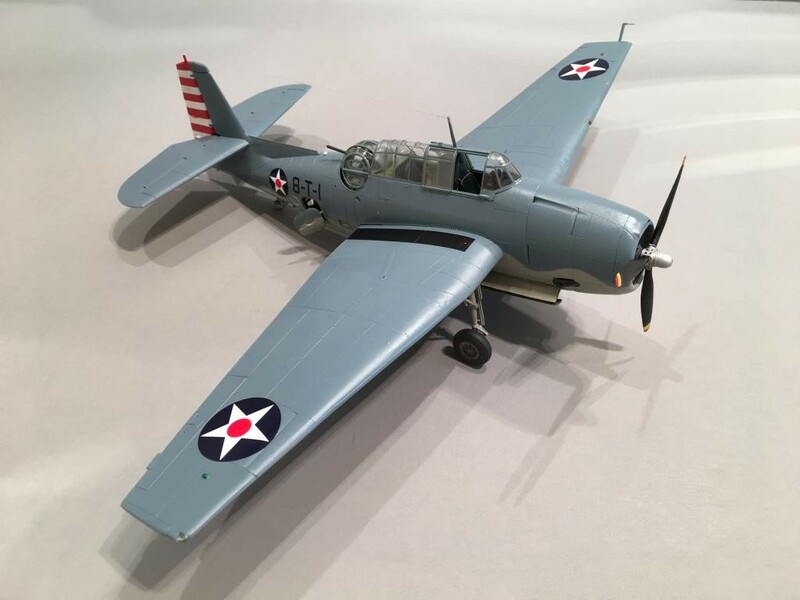 I have a few more of these AM Avenger kits in the stash, and one more almost ready for paint. I think they do build up into a very nice looking plane. Thanks again for the compliments my friend…………….. Very nice,Louis, as well as good information on how to back date this kit. 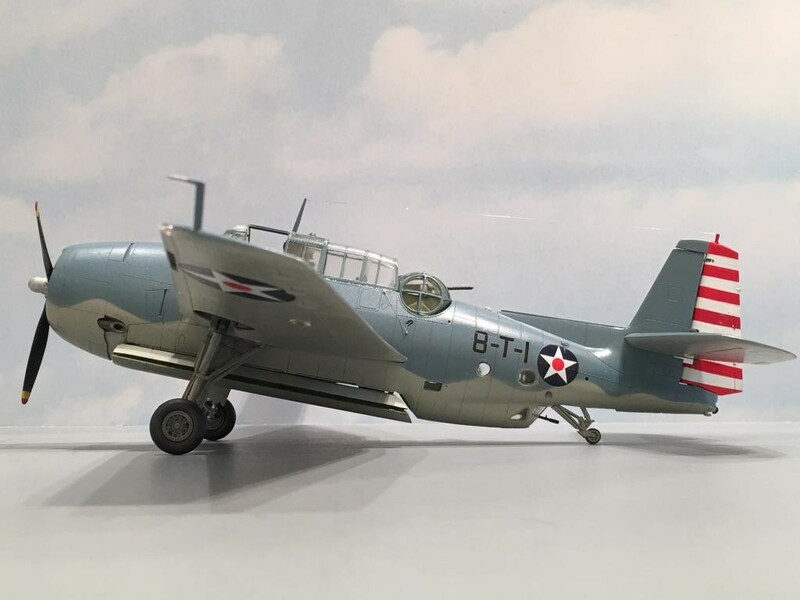 I had some information available to me since we have an early TBF-1 that was fished out of Lake Michigan, and is being restored near our local airport. But I missed some things. 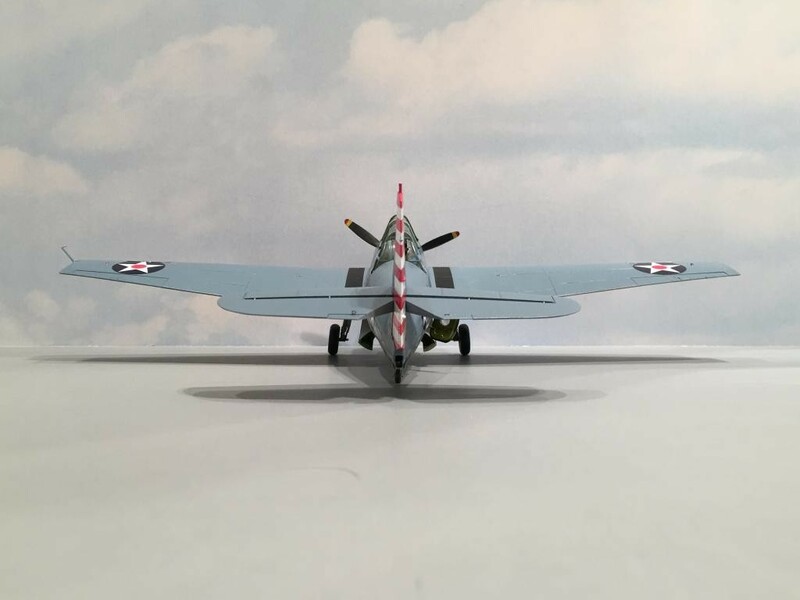 Martin Dytrick came through with some great photos and line drawings for me, just like you did for me on the PBY build that was part of the Midway GB. Pretty much everything I have listed above should do it. 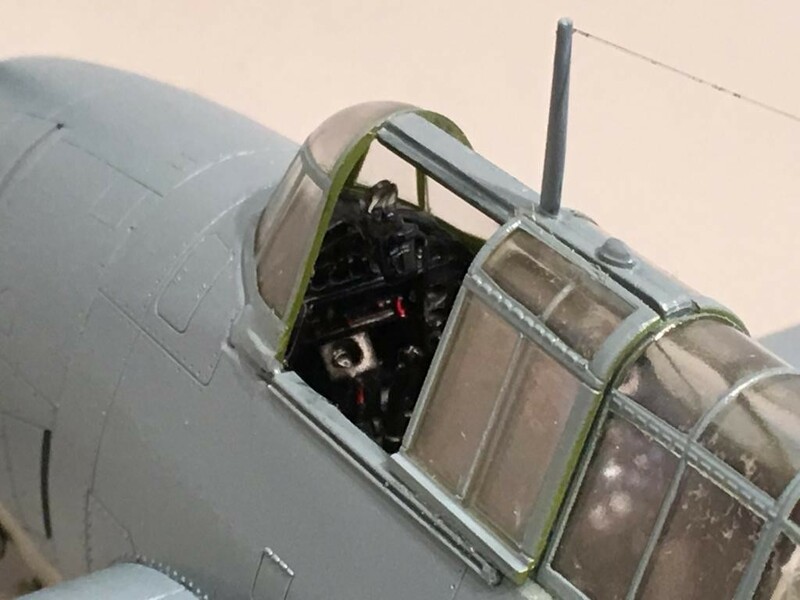 But prior to combat, I have seen where more often than not, the middle seat was removed and a larger more squared radio set was installed. The British kept the seats in their early “Tarpons” though. Simply outstanding narrative, photos and especially that model, Louis. WOW! Thanks Craig !!! I appreciate the kind words my friend. Really nice work, Louis. That’s an excellent conversion. One thing I noticed in your extreme close up shots is that your paint is just a little bit thick. I find that for airbrushing, I want a minimum of 40% thinner, and often 50% works to give a nice smooth coat. Not a complaint, just a suggestion. You’re absolutely correct about the paint. I don’t take it as a complaint. I was experimenting with Future on this one………… But the base coats of Blue Gray and Light Gray are too heavy. I finally got the mixture correct on my PBY. Just as you said. 40-50 percent thinner…………. Is this using enamel paints? Or acrylic? 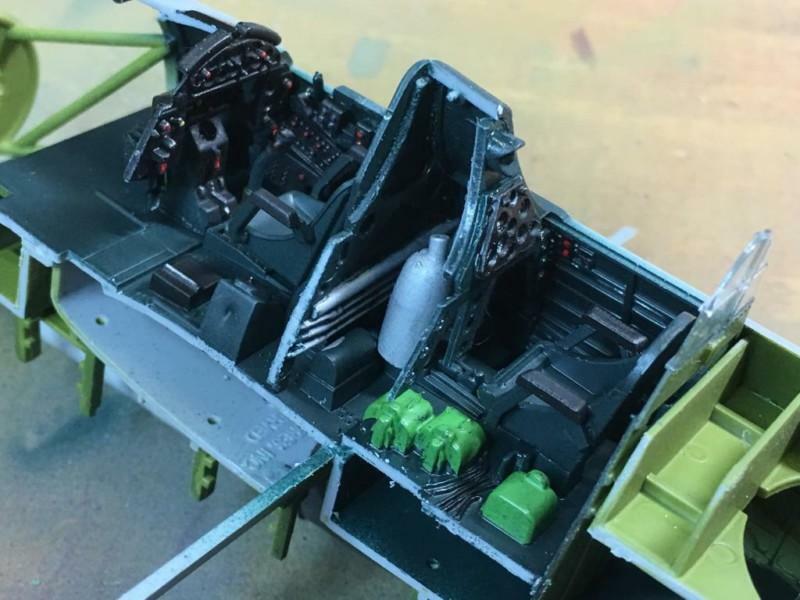 Another super build and wonderful post Louis! I had no idea that Midway was the first combat for the Avenger, or that it ever served in the “red center ” markings – loved the photos. Many hanks for all the effort you’ve put in! Thanks again Dave……………. I’m glad you enjoyed this one. Great build! Had forgotten about the Avengers at Midway. Thanks Bob. I appreciate the compliments buddy………….. Thanks Rick. 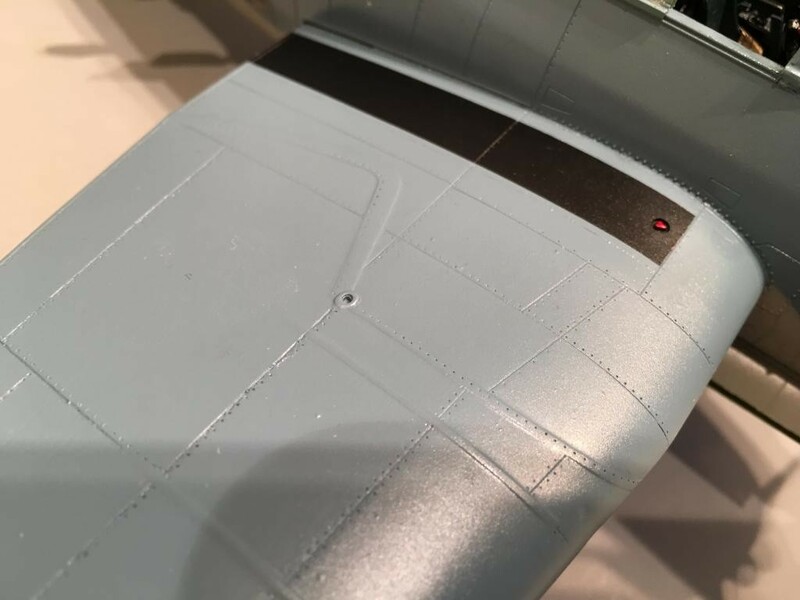 Sometimes I get in the “Zone” and things just happen……….. it also helps that I have a little more time now to devote to the hobby. Louis is not only fast but he does a GREAT job! 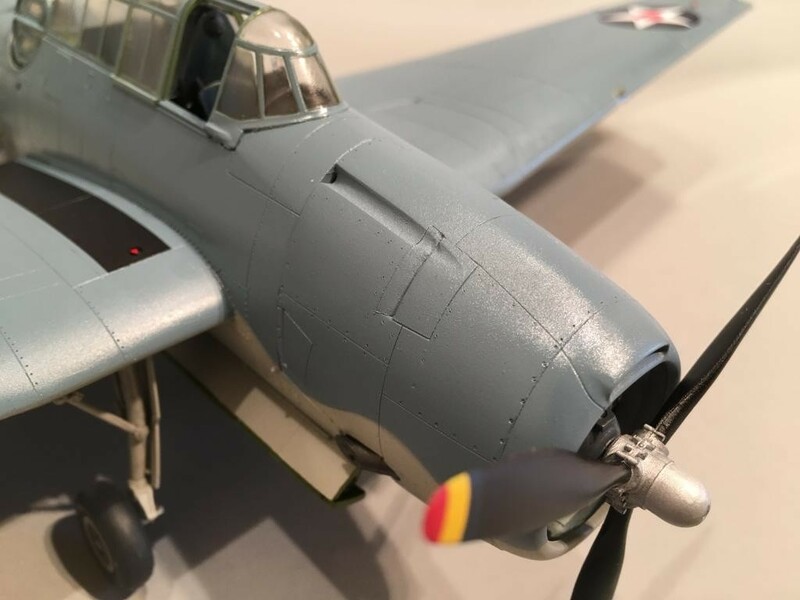 This is a great model of one of my favorite Navy planes. When you described what you’d done to remove the wing machine guns (were they Cal. 50 or 20mm?) I remembered that the TBM/TBFs had carried a couple more guns that the pilot controlled. The TBF is a very cool plane…………. and it’s really big in real life. The wing mounted guns were .050 caliber weapons. 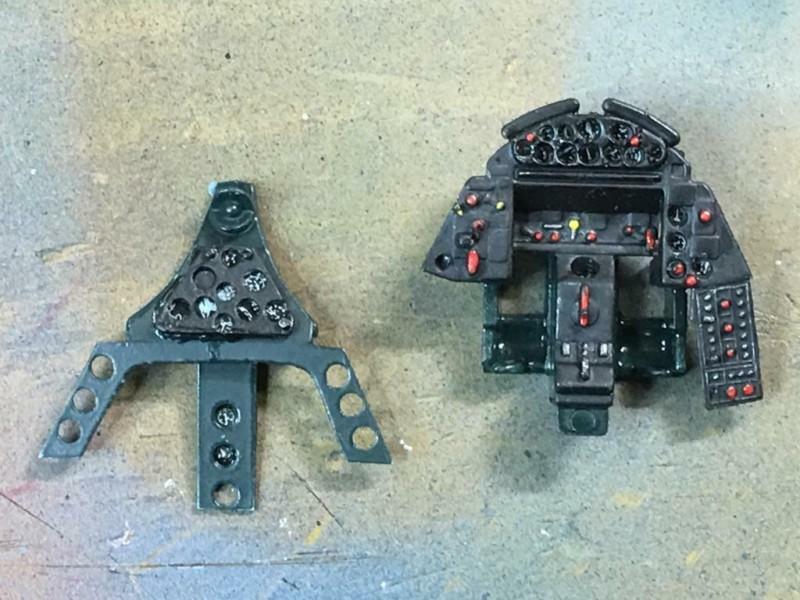 One was mounted in each wing for the pilot to use on the later variants. The Curtiss SB2C had the wing mounted 20 MM cannons.